Preface: Walking to Margaret Jacks Hall, I noticed that the tiles around Stanford's Quad had an 8-petalled flower logo which resembled the cover of Merwin's The Compass Flower (1977). I got here early and found an aisle seat in the 2nd row. A woman in the front row had a copy of Merwin's Vixen which she borrowed from the Los Altos Library. I asked her to see the book and jotted down some lines which I missed in my notes at yesterday's Merwin reading. Eavan Boland, Director of the Creative Writing Department at Stanford introduced Merwin to the Colloquium that was packed in the Terrace Room of Margaret Jacks Hall. Merwin began right away with a Q&A session. Below are my quickly jotted notes. Items in [brackets] are my additions along with Merwin books and web links. After the colloquium, lunch was served on the patio and I had a chance to talk to Sam Hamill, the publisher of Copper Canyon Press. I told him that Robert Bly used his translation of Lu Chi's Wen Fu in his Poetry Workshop at Asilomar (1988), which I enjoyed reading. Hamill told me about his time in the Orient learning Chinese. He knew Kenneth Rexroth who did many translations of Chinese poetry. I had read somewhere that Rexroth had all the Bollingen editions of mythology and sacred texts, and asked Hamill whether this was true. He said yes Rexroth's personal library was voluminous with signed first editions of most of the major poets and scholars of his generation. When I mentioned Stephen Mitchell's translations of the Tao Te Ching, Hamill said it was not a faithful translation as Mitchell doesn't know Chinese. I defended Mitchell saying that he had studied with Korean Zen Master Seung Sahn, and I had attended many of their Dharma Talks at the Cambridge Zen Center. Hamill said "Mitchell's work is not a translation but a rendition. The original Chinese words of Lao Tzu are not even present in Mitchell's version." I then asked, "How about the translations of William Porter (Red Pine) on the Tao Te Ching and Cold Mountain Poems of Han-shan?" Hamill replied, "Now that's someone who paid his dues. Porter spent many years in Taiwan's Buddhist monasteries studying both Zen and Chinese. So the spirit shows in his translations." Hamill and I exchanged email addresses to keep in touch. Merwin doesn't do email, but gave me his P.O. Box address in Haiku, Hawaii. 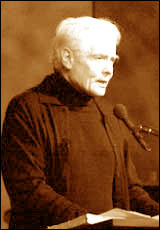 No wonder Merwin's writing is so uplifting and inspirational he is living in poetry! Q: Paradox plays an important role in your poems. "Listen to darkness" sounds like a Zen koan. How much Zen is there in your poems? A: Any relation to Zen koans is unconscious. Zen certainly influenced me. I was brought up as a Christian Presbyterian. "Does the Tathagata has a teaching?" and Buddha answers "The Tathagata has no teaching to teach." Paradox is built into everything. It's amazing that we have language at all. just as gardening is living agriculture. Recognition of sound as experience it becomes a word. Language, poetry, Zen all have paradox. Dogen says "One side of your hand is in the daylight. The other side is in the dark. Pupil of the eye is a reflection of yourself. Pupil is also the student, the child learning. They find Shakespeare very chaotic. Q: I'm curious in your process of writing The Folding Cliff? A: I found this story from a compendium. The story I encountered was a chocolate-covered box. The cliffs are 4000 feet high she went down by herself. I carried this idea around for ten years & couldn't forget this story. [Agnes Conrad] who unearthed an archive of the Board of Health. I'm not a historian or novelist, so I told this story as a poem. going to all the patients' records the names mentioned are real. Q: The last time I heard you read was a year and half ago. and the convergence of politics and writing. A: My friend Sam Hamill is here. He organized "Poets Against the War"
I don't think it's a war. Every path of ourselves is history. The other side is not history. People's lives are tuned to Fox News all the time. It's very psychotic and unreal situation. We shouldn't put it down. Human treatment of animals are terrible. Suffering is OK, but creating suffering is not. We don't have the right to do it. seems independent. Did you plan this in the beginning? Wordsworth's Prelude, it wouldn't have worked. Many could be read as a gage or even a single sentence. the way Welsh stories are broken up. as the first word in the next section. "No man ever wished it longer." fewer people would drive. Your own work has been compared to Walden. Do you celebrate nature, raising awareness on ecology of the earth? pain, wonder, and awe. I'm suspicious of "nature" what's unnatural? political writing, especially if you're certain then you could be wrong. a stove." If you force it, someone will detect it. Most political poems are bad. anything you write is good, and he told me: "You can't never be sure." That's a jewel. If you think you do, the muse will hold it against you. you name places in your work are these places sacred? A: It's a process of getting older and finding ways to anchor and to name places. Life Studies is not my favorite work of his but quite remarkable. that direction. The Vixen, Travels, Folding Cliffs all have names. But if you name by force, you could ruin the poem. Q: Line living in history and pushing forward. How do you see yourself? "Stick around. A good education won't do you any harm." Knowledge is a good thing valuable. where we do not know. this line is a miracle. It moves between the known and unknown like a bird. Basho didn't write haiku like that. How long did it take you to write it ten seconds? or is it 25 years [up to that moment]? Q: Could you tell us about your visit with Ezra Pound? in Washington D.C. where he was staying. He would be happy to see me. There was a huge gulf between us [Pound was 60 & Merwin 18]. that Pound's 100 Cantos was like a capstone to a building. of his cranky notions. But embedded in them are gorgeous lines. He talked to me about himself. To my amazement, he took an interest in me. to learn languages or be a slave to the translators. Translations will make you find out what is possible. You're forcing English to do something it couldn't before. Pay attention to the Provencal poets and the romance language. they were at the beginning of poetry. Bessie Smith came out of the Troubadours. The Troubadours came from the Arabs in Spain. Indian Love Poems, it's hard to tell which is which. A: Use the ear you've got when doing the translations. Bad academic translations don't use anybody's ear. which I'm sure no one in this room has heard before. There is a poet of my generation John Peale Bishop. "Far from the birds, the herds, the village girls"
from Rimbaud's "Loin des Oiseaux, des Troueaux, des Villageoises"
In the warm green mist of an afternoon? Hut? Gold that drunk brought sweat to the skin. I might have swayed a queer sign for an inn. And a wind from God flung glass on all the ponds. Weeping, I saw the gold, and could not drink. A: Jeff Masson would sent me a page of poem which he translated from the Sanskrit. We corresponded entirely my mail. I didn't meet him until many years later. get the rhyme & metre of the original and lose everything else.